The Colibri's web interfaces allow the user to configure remote access options. Some browsers report an error message Unable to find object during the login process or when browsing the web interface. We saw this issue with some versions of Internet Explorer and Firefox. However the web interfaces still can be used in most cases. If it doesn't work at all, please use another browser. The default security settings of Windows Vista and Windows 7 block the login into the Colibri's web interfaces. Enter a password. This action enables the user admin and it can be used in further sessions of remoteadmin, webadmin, telnet etc. The webadmin interface allows you to enable and configure a web server on the Colibri module. You will be asked to log in. 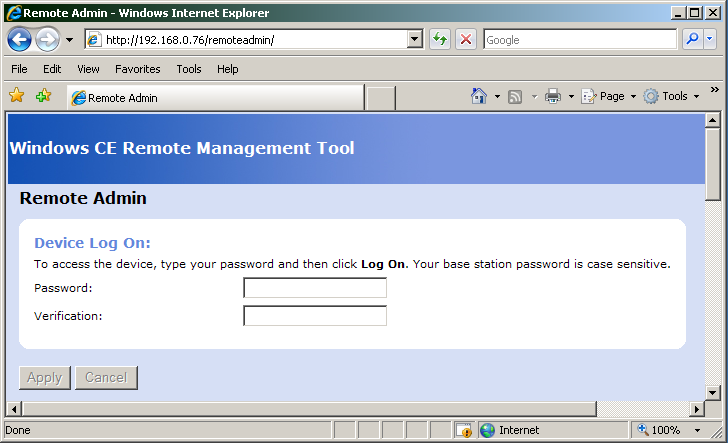 Use the username admin and the password you entered when you used RemoteAdmin the first time. The SysAdmin interface is only available in Windows CE 5. The SysAdmin interface allows you to launch and kill processes, to browse files and to edit the registry on the Colibri module. Dll = "_HTTPD.DLL"  ; was "HTTPD.DLL"
Save the registry and the next time you boot the service will not be loaded again. Either you clear the registry. This is a quick task but you will loose all your registry settings as well. Or you can reset the admin user. You have to do the following steps. Save the registry and reboot your module. After that you have to enter a new password in the webinterface.